Sugar Gupta completed a PhD in Biological Engineering and a Masters of Business Administration at the University of Missouri. Gupta is an administrative fellow with University of Missouri Healthcare. Sagar Gupta, a recent MBA graduate from the Trulaske College of Business, left his home in India to pursue an education here at Mizzou. He had already earned a bachelors in biotechnology, but he was not ready to stop learning and was attracted to the level of research that was being done at the universities in the United States. It was the research at MU that impressed him the most. With a graduate assistantship and the drive to make a contribution to the world around him, Gupta began his PhD program in biological engineering in 2007. Though he did not know it at the time, his tenure at Mizzou would result in so much more, including a Ph.D., post-doctoral appointment, and a Masters in Business Administration. During his years as a Ph.D. student, he worked to create a system that used sensors to detect cancer cells in the body. Essentially, when cancer is suspected in the body, it can take some time to get clear results as to the diagnosis. This would include biopsies or invasive procedures to remove a portion of the tissue to test for cancer. Similarly, when a patient is in the treatment phase, they sometimes have to wait months to learn if treatments are working or if cancer has spread. Gupta’s Ph.D. research aimed to change that. This research had great potential for commercialization, and Gupta was advised by his professor to take classes from the College of Business. It was truly the start of something new and exciting. He was given the opportunity to help a local startup create a business plan that combined people from different fields including engineering, researchers, and lawyers. Gupta was catapulted into the world of business, where he has flourished. But his journey at MU did not stop there. After completing the Ph.D. in 2013, he started working as a post-doctoral scientist with the School of Medicine where he now works with nanotechnology. Gupta does not shy away from hard work as he officially began his MBA program and his post-doc position at the same time. His post-doc allowed him to explore research using nanotechnology, a popular field that is gaining traction at the moment. This research uses nanotechnology to extract enzymes during the production of ethanol. The goal is to lower ethanol cost per gallon to the cost per gallon of gas. This process could potentially lead to price drops in fuel. Though this method is still in the research phase, the team has been able to increase savings by over 20 percent so far. It is a platform technology that can be used for other things, including pharmaceuticals. He flourished in business, and he credits his professors at Mizzou for their encouragement. Though he started off on a research career, one class in the business school lead to a new degree program and a new path. “My graduate mentor [Dr. Kattesh Katti] who is my post-doc advisor, he not only concentrates on research. He encourages us to do something more. Something you are interested in,” said Gupta. This mentoring from Dr. Katti and other professors helped Gupta find the path that best worked with his interests. 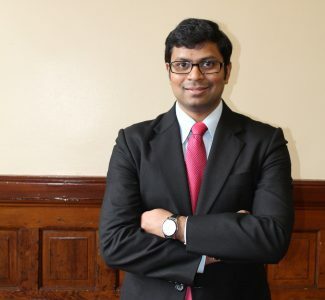 Gupta found great help from the MBA program, which allowed him to plan his schedule around his work at the University. He credits the professors and staff in the business school for a lot of his success because the program gave him real-life training opportunities. The partnerships between students and companies are a win-win situation. Gupta worked with a company called Elemental Enzymes, an environmental startup. Gupta and his team of fellow MBA students designed a business plan for the company and pitched it to investors. Opportunities like this introduced him to other professionals and students. He realized that research is important, but the business side is a huge enterprise. “We also got selected to the Walmart regional business Plan Competition, and we won it. We went to the nationals.” His team was awarded fourth place, an impressive feat. Gupta worked for the start-up company, founded by MU professors, to enhance the affordability of biofuels through the enzyme retrieval process studied in his post-doc position. His MBA training also allows him to work with potential investors. This way, he is able to contribute to business plans without hiring someone else to do it. The combination of his Ph.D. and MBA is “bridging the gap between science, technology, and business.” They needed someone who could understand more than one aspect of the company’s goal. As a result of his success at Mizzou, Gupta was recognized by Poets and Quants as one of the Best and Brightest MBAs in the Class of 2016. The students recognized come from schools all over the country, including the top business colleges. This is the first time that Mizzou has gotten this recognition. He credits the resources at the University and the people he has worked with for his successes. His advisor Dr. Katti has had a huge impact on him. In his, rather limited, free time, Gupta likes to run and recently ran his half marathon. It helps him stay motivated. He also enjoys going out to eat and to the movies, especially in Kansas City. His wife works at the University of Kansas Incubation Center as a research assistant professor. They get to see each other once every few weeks, but regularly talk on the phone, a point of personal enjoyment and intellectual stimulation for Gupta. Gupta recently joined as an administrative fellow at the University of Missouri Hospital. Through his diverse training at MU, he can now apply the clinical concepts he learned and developed as a scientist and the managerial knowledge through his MBA to improve the quality of life of the people in the Mid-Missouri region. Gupta’s experience at Mizzou has forever changed him and shaped him into the person he is today.